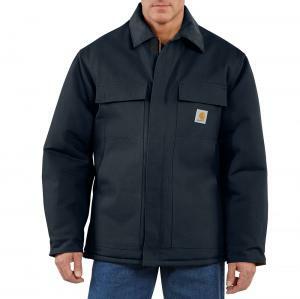 Built to withstand harsh winters, this arctic weight coat is one of the warmest Carhartt offers. Bought a C003 years ago. Size 48. Best work coat ever. Wore it out. Still warm though. Ordered a new XL. It’s way too big. Sending that to my son. Ordered a L. It’s almost too small. I’m 6’2” 225 lb. Great jackets but very disappointed with the sizing. I have a old Carhartt jacket, do not know what style it is, or style number. This jacket that I bought, fits me to the tee. It is warmer, and I like it. The old jacket has the logo done by a machine, does not look like new jacket logo. That gives you a idea how old it is. I believe the jacket will wear great, the fit is interesting. As others have said, the arms are made for a body builder or gorilla, probably enough room in one for both of my arms. I f only I got the color I ordered! I can't comment on durability yet, but my other carhartt jackets have been very durable. Great coat. Lasts through hard Midwest winters on the farm. Daily use with extreme wear and tear and the coat outlasts any other brand while maintaining function and warmth. Only brand that will fit an CL tall like it should . Breaks in to a moveable and lighter finish. Big and tall and nice looking ! LOVE IT!!!!!!!! I would recommend to anyone. Great quality!! It’s the first jacket i’ve received compliments on in long time. It’s very comfortable also. Runs large. I ordered 2x but should have gotten a 1x. great coat, once I figured your size table. I usually take a 3xl. but your sizes run large, so I ended up with a 2xl. fits perfectly. My last one lasted 20 years. Hopefully the new one last just as long.